This year’s Annual Dinner promises to be a very special evening. We are delighted to confirm that it will be held at Leyton Orient F.C. 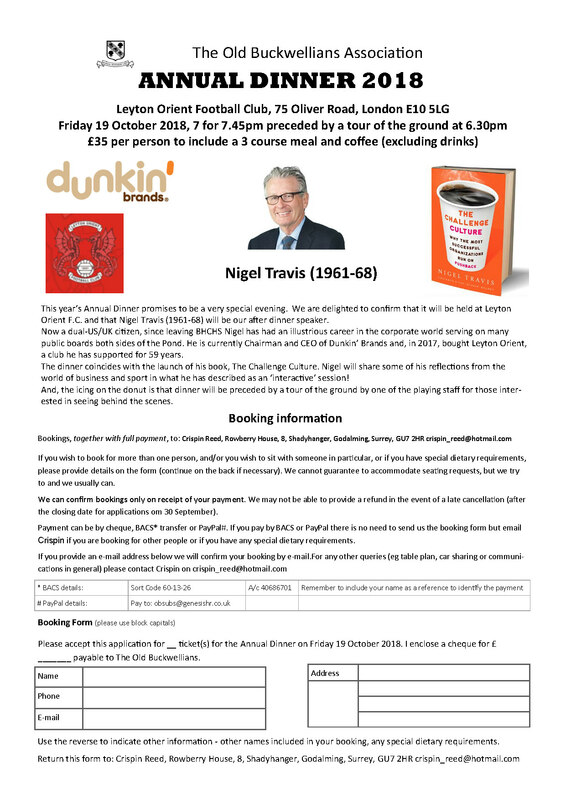 and that Nigel Travis (BHCHS 1961-68) will be our after dinner speaker. Now a dual-US/UK citizen, since leaving BHCHS Nigel has had an illustrious career in the corporate world serving on many public boards both sides of the Pond. He is currently Chairman and CEO of Dunkin’ Brands and, in 2017, bought Leyton Orient, a club he has supported for 59 years. The dinner coincides with the launch of his book, The Challenge Culture. Nigel will share some of his reflections from the world of business and sport in what he has described as an ‘interactive’ session! And, the icing on the donut is that dinner will be preceded by a tour of the ground by one of the playing staff for those inter-ested in seeing behind the scenes. You can check all the booking arrangements below. There is no need to download or post the form if you send your details by email as per the instructions and make your payment via BACS or PayPal. All of the content on this site has been researched and provided by past pupils of Buckhurst Hill County High School. We are always interested in adding to this resource and ensuring the accuracy of the information on the site, so if you have further details regarding information on this page please click here. If you have information that has not been allocated a page or you are unsure where it should go please click here. Withhold Name : We encourage the attribution of contributors but it is not compulsory. Email Addresses are not published on the site. Withold Name : We encourage the attribution of contributors but it is not compulsory. Membership includes the bi-annual newsletter, and invitations to the Annual Dinner and other Network events.